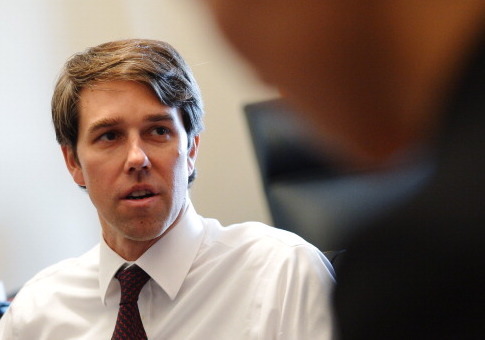 Rep. Beto O’Rourke (D., Texas), who is running to unseat Sen. Ted Cruz (R.), said Wednesday there’s "nothing more American" than kneeling in protest during the national anthem. At a campaign stop in Houston, O’Rourke took a question about whether it is disrespectful for NFL players to kneel during the anthem. O’Rourke said the question raises "a tough issue" Americans must discuss and can reasonably disagree on, but he said the protests continue the tradition of agitating for civil rights. NowThis News posted a video of O’Rourke’s speech, adding music and saying it was "perfect." "The freedoms that we have were purchased not just by those in uniform—and they definitely were—but also by those who took their lives into their hands riding those Greyhound buses, the Freedom Riders in the Deep South in the 1960s, who knew full well that they would be arrested, and they were, serving time in the Mississippi State Penitentiary. He commended the Civil Rights Movement and celebrated protesters in the past who put themselves in danger to oppose Jim Crow laws, comparing them to the NFL protesters. "Peaceful, nonviolent protest including taking a knee at a football game to point out that black men, unarmed, black teenagers, unarmed, and black children, unarmed, are being killed at a frightening level right now, including by members of law enforcement, without accountability and without justice," O’Rourke said. "And this problem, as grave as it is, is not going to fix itself." He said players have the right to be frustrated with public officials who have been unable to resolve problems with police violence. "And so non-violently, peacefully, while the eyes of this country are watching these games, they take a knee to bring our attention and our focus to this problem to ensure that we fix it," O’Rourke said. "That is why they are doing it, and I can think of nothing more American than to peacefully stand up, or take a knee, for your rights, anytime, anywhere, any place." This entry was posted in Politics and tagged Beto O'Rourke, National Anthem, NFL, Protests, Ted Cruz. Bookmark the permalink.